Bird Box memes: 19 hilarious Twitter reactions and memes. 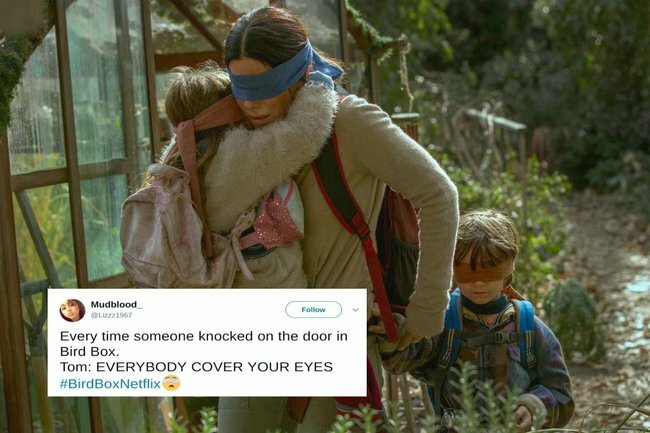 19 hilarious reactions to Netflix's Bird Box. Dropping on Netflix right before Christmas, Bird Box has already become the holiday movie of choice for people who are frankly sick of Christmas movies. And for those who just want to feel completely and utterly terrified. Based on the 2014 post-apocalyptic novel by Josh Malerman of the same name, and starring Sandra Bullock, the movie follows Bullock and her two children as they embark on a dangerous quest for sanctuary in a world that has been decimated by a wave of mass suicides. Stalked by “the creatures” who have the power to drive humans to take their own lives, Bullock realises that to survive the remaining humans must keep their eyes closes or covered to avoid succumbing to the frightening supernatural creatures. When you can’t afford Netflix but the kids wanna watch #BirdBox⁠ ! !